TEMECULA – For thousands of local children, back-to-school shopping just doesn’t happen. For families struggling to put food on the table, buying new clothes is a luxury they can’t afford. That’s when Assistance League of Temecula Valley comes in. 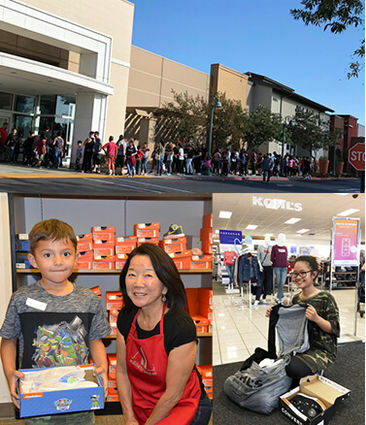 During the 18 Operation School Bell® “shopping events” from August to October, 2,629 identified low-income students from the Temecula, Murrieta, Menifee, Lake Elsinore and Romoland school districts shopped for $125 worth of new school clothes at the Kohl’s in Temecula, Murrieta, Menifee and the Lake Elsinore Target. Since the program’s adoption in 1989, when 33 low-income students were provided with new school clothes, Operation School Bell has helped more than 39,000 children in the southwest Riverside County. Assistance League appreciates the support of corporate partners. By their ‘Share the Love’ donation last year, Temecula Subaru Mazda sponsored the Operation School Bell “shopping event” for 111 students at the Menifee Kohl’s, Oct. 22. To participate in the program, families in the Temecula, Murrieta and Lake Elsinore school districts submit an online application at the beginning of the school year sent out by the districts. Students in the Menifee and Romoland School Districts are referred by the school health technicians. It is planned to have these districts use online applications in the near future. Students are assigned dates and times for one of the “shopping events” held at Kohl’s stores and Lake Elsinore Target. With the guidance of Assistance League volunteers, the families choose and purchase new school appropriate clothing at no cost to them. The purpose of Operation School Bell is to enhance self-esteem, promote learning and encourage regular school attendance. Assistance League Thrift Shop, 28720 Via Montezuma, in Temecula, is the main source of revenue for all chapter programs. Assistance League of Temecula Valley is a nonprofit, all-volunteer philanthropic corporation dedicated to serving the needs of families in southwest Riverside County for the last 29 years. Last year, chapter members volunteered over 33,000 hours of community service on behalf of local families in need. For more information about philanthropic programs or membership information, call (951) 694-8018 or visit the chapter website at http://www.assistanceleague.org/temecula-valley.